I am exhausted today. Yesterday was a whirlwind of marching, lobbying, writing, tweeting, picture taking, interviewing, chanting and more marching. But it was more than worth it. I was standing side-by-side with more than 8,000 people (according to National Mall staff) as we marched to the front door of Congress to demand comprehensive immigration reform. Before the event, over 900 of those people talked directly to their members of Congress about supporting immigration reform and specific pieces of legislation such as the DREAM Act and AgJobs. This number doesn't even cover the more than 20,000 calls and faxes into Congress that were made by people across the country, as a part of yesterday's action for reform. We showed power yesterday, both in DC and across the country. We simply cannot wait any longer for a bill that keeps our families together, protects our workers and allows a pathway to legalization for those who have earned it. It is time we had a workable plan making its way through Congress that recognizes the vast contributions of immigrants to this country and that honors the American Dream. The event has garnered much media attention, though it was drowned out yesterday by the continuing health care debate. If you didn't hear about the rally, it's not surprising. It didn't take place until late afternoon - after the passage of the health reform bill but news outlets are slowly getting around to writing about it. And they should be because this wasn't the usual caravan-to-Washingon-and-demand-immigration reform rally. 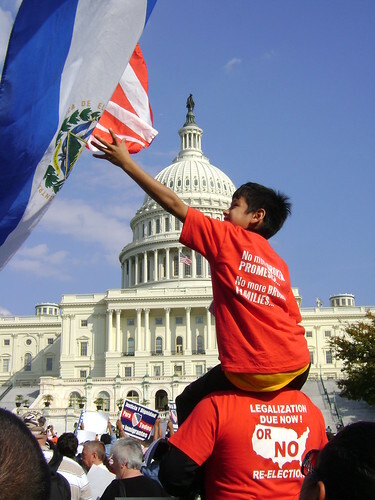 This rally was different in that it served as the platform where Illinois Rep. Luis V. Gutierrez, chairman of the Immigration Task Force of the Congressional Hispanic Caucus, attempted to jumpstart the immigration debate by unveiling the "core principles" he wants seen included in any immigration reform bill. 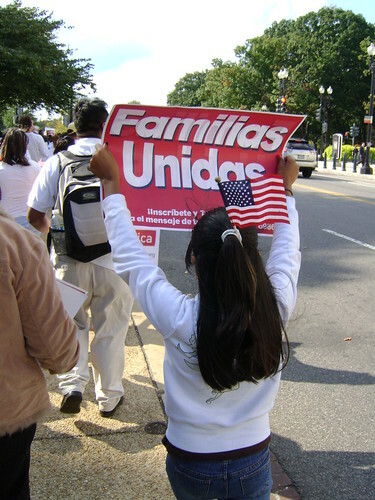 She's right: this wasn't a typical march to the Capitol to call for immigration reform. There was substance and passion and true momentum behind yesterday's event. Number one, the fight for immigration reform has officially started. Number two, we haven't even begun to tap the potential support for a pro-migrant progressive bill. The fact that thousands of out-of-town people turned out in person, drove hundreds of miles, fund raised and even missed work to be at a pro-immigrant event where the main draw was only principles of a potential bill, sends a very clear message: we are ready for this fight. That is not to say this won't get ugly. I never underestimate the nativist lobby's ability to stoop lower and lower in their demonization of immigrants and of our movement. But, the true power and the true majority is with us. For a more about yesterday and full slideshow of photos, visit the Reform Immigration FOR America Blog. Family Unity: Bringing it to the Capitol.